Rathfriland was formerly known as Insula Magennis and Hugh Magennis had a castle there in the late 16th century. There are still some traces of a tower-house. The Manor of Rathfriland was granted by Charles II to Alderman Richard Hawkins of London in recognition for his services to the royalist cause during the Civil War. It is essentially a Plantation town with a square containing a market house and a church. 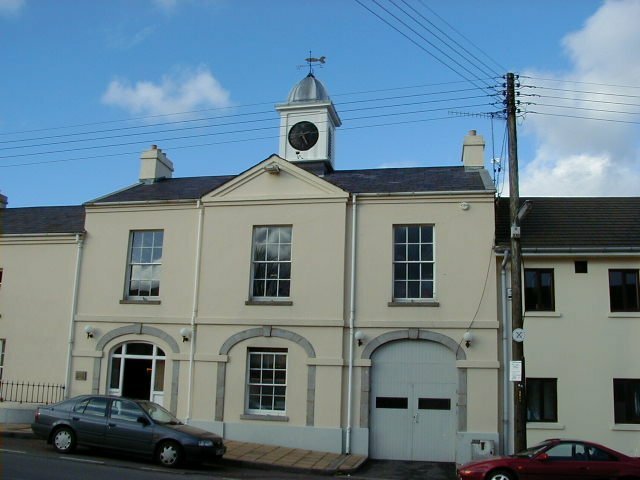 Rathfriland Market House was erected in 1764 by Miss Theodosia Magill, later 1st Countess Clanwilliam. It is a three-bay two-storey building with single bay additions at the N and S. The stonework differs considerably in the additions. In the S gable is a granite stone dated 1951. It is carved with a double-headed eagle and initials JWM. About 3km west of Rathfriland, in Barnmeen, is a large standing stone (J172330). It is c.3m high and at the base measures 1.2m N-S by 1.4m E-W. The stone becomes much narrower in its upper third forming a definite shoulder. It is a rounded granite pillar similar to other "Long Stones" in Co Down. Cattle have eroded a groove around the base of the stone but its stability is not threatened. The OS Memoir of the 19th century reports a souterrain about 200m ESE of the stone. This was about 35m long by 1.2m wide. For about half its length it was less than 1m high but increased to just under 2m. At the inner end there was a well, the water from which was considered beneficial for healing sores. The souterrain is not now accessible. To the NW of the standing stone is Lisnabrean Rath (J170337) which is over 40m diameter with a well preserved bank and ditch. In Saval More (J122312) is the small private graveyard of the Gordon Family. It is set at the E end of a small grove. Within the graveyard are two standing stones which may be the remains of the curving facade of a court tomb. The stones are large granite blocks set 2.63m apart. The N stone is 1.64m high and leans slightly to the W. The NE stone is 2.2m high and the top rises slightly to a point. One of the memorials in the graveyard is to a military gent who died of a heart attack while hunting with the Armagh Harriers. The local foxes are still smiling. In the adjacent townland of Saval Beg is another standing stone (J120310). It stands about 2m high on a low mound which may be partly field clearance. The standing stone in Mayo (J160266) is another massive granite boulder. It stands about 3.1m high and measures at the base 1.5m wide SSW, 1.1m wide W, 1.84m wide NNE and 1.38m wide ESE. Around the base of the stone, espacially at SSW and ESE there are remnants of a tussock, less than 20cm above the field surface. Running off from the base at ESE is a small mound 1.45m long and less than 1m high. Some earthfast stones project from the turf. Hilltown was originally known as Carquillan or "Eight Mile Bridge". The town is part of the Downshire Estates and was named after the Hill Family who became Marquises of Downshire. The market house was erected about 1800. It is a two-storey three-bay structure with the central bay breaking forward and surmounted by a pediment. There is a cupola with a weather vane. It is a T-shaped building with a stairway in the rear projection leading to the courtroom which was on the first floor. 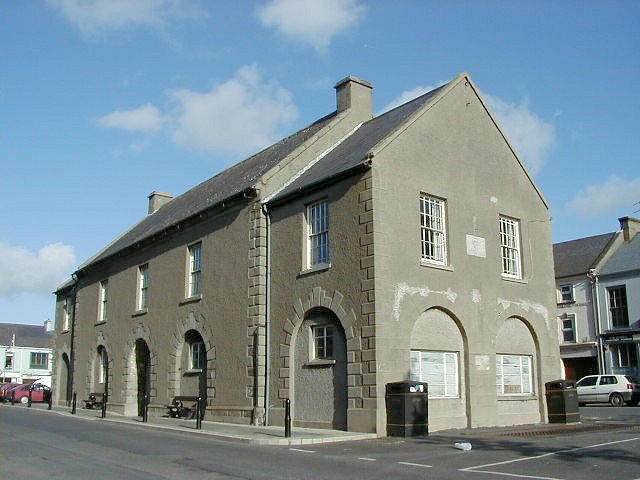 The market house now forms part of the adjacent Downshire Arms Hotel which dates from the same time. Across the street is the parish church of St John, which was built in 1776 by Wills, Earl of Hillsborough. It is a nave-and-chancel church with a W tower. In Goward townland there is a very fine portal tomb (J244310). It is known locally as Pat Kearney's Big Stone and has also been referred to as Cloghmore Cromlech and Finn's Fingerstones. It is built of granite with an enormous capstone, 1.5m thick, roofing a long rectangular chamber, about 90cm high, with an end stone 1.5m high. The higher end of the capstone has slipped and is now supported by two tall stones, 1.65m and 1.98m high, which appear to form a crescentic facade of uprights with other stones. Another thin slab, now lying over the W end of the chamber may have been a collapsed W end stone or a second minor capstone. Close to the dolmen are the boulder remains of a house. These stones may have been robbed from the original cairn. A cremation urn and arrowhead were found during excavation. Elsewhere in the townland there are several megalithic structures including a very fine court tomb (J237296). It has a semi-circular forecourt, 11.5m diameter, composed of 11 orthostats. The burial gallery is 9.1m long by 2.9m wide and it has three chambers. There are some remains of a cairn 24.3m long by 17.5m wide. Excavations in 1932 revealed that it had been used as a habitation during the Iron Age. Ox bones and Neolithic pottery were found. At Kilbroney Graveyard (J188195) there is the ruin of a small nave-and-chancel church covered with ivy. It was probably built in the 15th or 16th century with the chancel being a later addition. Legananny Dolmen(J289434)is one of the most majestic and striking of the megalithic tombs. It is an unusually tall dolmen with portal stones at the S end, 2m and 1.8m high. The single support at the N end is 1.2m high. These three stones support a capstone about 3m long and 60cm thick. It has often been described as "coffin-shaped". A single slab lying beside the capstone may be a structural feature or it may be part of the cairn, traces of which can be seen in the grass under and around the dolmen. To the E of the dolmen is a small disused graveyard (J303427). Most of its stones are plain markers which are low and overgrown. The most notable feature is a tall granite stone with a linear cross on its E face, standing at the NE corner of the graveyard. It is 1.8m high by 37cm wide and 36cm thick.